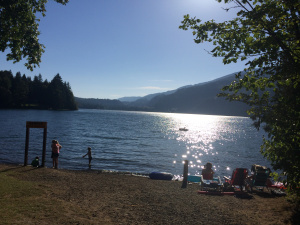 Could a Lower Mainland-based campsite blog not include Cultus Lake? Cultus is one of the few lakes in the region large enough to water ski, and its just inland far enough to escape Vancouver’s cool marine climate. As such, its a very popular day trip and camping destination. 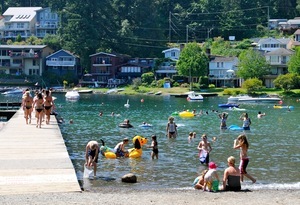 Cultus Lake is only a 20 minute drive from the TransCanada Hwy at Chilliwack. A small village hosts a good waterslide park, a public wharf complex designed into a great swimming area, ice cream stands, a putting golf course and other tourist activities. If Cultus’ weather does get wet, then that 20 minute drive finds Chilliwack’s shopping malls, indoor municipal pools, movie theaters or restaurants. Just the other side of the village is Sunnyside, a popular private campground that we have never stayed at so would appreciate reader comments for this blog. ← Spring Break For A Canadian!